MyNetDiary provides a great, easy and most comprehensive tracker app for iPhone, helping people track and manage their diabetes or pre-diabetes, to keep track of blood glucose and control carbs. Whether you had diabetes for years, or you are newly diagnosed, or diagnosed with pre-diabetes - MyNetDiary has all the tools to help you, to stay in control, to eat better and feel better. Our web-based and mobile Diabetes Tracker was used by more than 50,000 people. An active user loses 12% of body weight on average. Average self-reported A1C reduction is 1.4%. 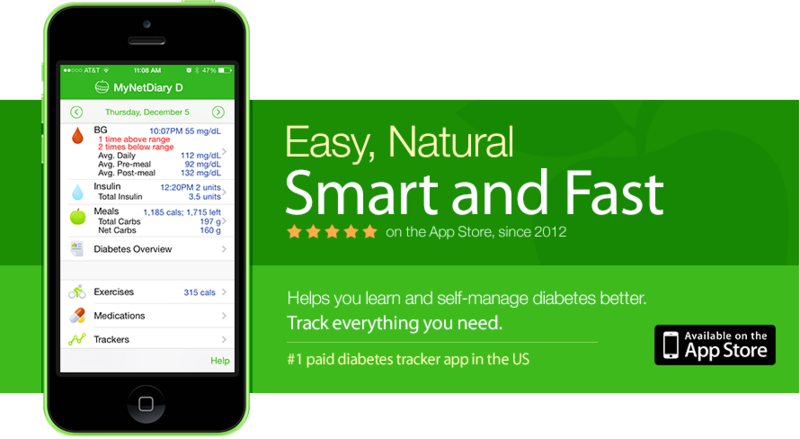 As someone newly diagnosed with Type 2 diabetes, this app has really helped me stay on top of my diet, medications and glucose levels. I have been a diabetic (insulin dependent), for 15+ yrs. I have fought A1C all those yrs (readings range 8.3-7.3). This App gave me the missing link for full control and weight loss as a plus. Now have all readings below 7.0. This app covers everything. I can plan my meals and snacks for the day. I can plan my meds, vitamins. I can log all of my glucose readings so that when I go to the doctor, I just hand him my phone and let him scroll through. If you are diabetic, this is the program for you. Don't look any further. This is the perfect program to control your blood sugar and lose weight you need. First of all - comprehensiveness. MyNetDiary has everything you may need to stay on top of your diabetes or pre-diabetes - food and carb tracking, medications, exercise, test results, body measurements and much more. Secondly, MyNetDiary is easy. The most frequent words in thousands of MyNetDiary reviews by its users are “easy” and “very user-friendly”. Taking only a few minutes per day, MyNetDiary can be with you for a long time. It's both comprehensive and friendly - the features are there when you need them, making tracking easy and you - successful. Special app for Apple Watch - the only diabetes app with Apple Watch support! MyNetDiary app is optimized for iPhone 5, iPhone 6, and iPhone 6 Plus. MyNetDiary is more than just the app - you can use our online service, logging foods and exercises, participate in our Online Community supported by Registered Dietitians for more help and motivation. Also, you can assign a label to each blood glucose reading, specifying, for example, whether this was a fasting, before meal, or 2-hour after meal reading. Moreover, you can assign multiple labels, not limited to these meal-related labels, but also capture your feelings, symptoms - anything you want to track and associate with the reading, to help you see patterns. The Blood Glucose row on the Home screen calculates your daily averages. MyNetDiary supports mg/dl and mmol/L units. In addition to regular reminders where you enter reminder time yourself, you can configure "after-meal" reminder prompts. For example, you can set prompts for 1-hour BG after breakfast and 2-hour after dinner, so that when you log your breakfast or dinner, you will be prompted to set a reminder exactly one hour or two hours after you started your meal. It's very convenient, one-tap action, which could greatly help you test your BG how you want it, reducing the chances of forgetting to test BG. You can also create multiple ranges of blood glucose levels, for different situations. You can create special ranges for fasting, pre-meal, post-meal. In fact, as you specify which labels are applicable for each range, you can create ranges for any other conditions, for example, for 2-hour post-meal readings. Low out-of-range readings are highlighted in red and high out-of-range readings are highlighted in yellow. Also, you can specify the lowest reading below which is considered as hypoglycemia for you and highest reading above which it is considered very high blood glucose and have MyNetDiary assign these labels automatically. To keep tabs on your diabetes and blood glucose, you need to track your carbs and other nutrients. Logging foods is the real challenge in diabetes tracking, as you measure blood glucose only a few times a day, but you need to enter many more foods each day. Tracking foods is much more labor intensive and thus it's critical to make it super easy in a diabetes app! MyNetDiary provides the best food database in the world, saving your time entering foods. Currently, MyNetDiary has over 716,000 verified foods. The quality of the database is ensured by MyNetDiary's PhotoFood Service. If some food is not in the database or out-of-date, you can send us its photos directly from the app, and we will enter or update all of its nutrients, saving you time and ensuring accuracy. MyNetDiary is so fast that it searches as your type, you don't need to type whole words and you can see results faster. MyNetDiary Diabetes Tracker goes beyond providing the best food database and food entry. Timing is very important in diabetes and MyNetDiary allows recording time of everything - foods, exercises, insulin, medications, and other trackers. Also, if you eat more than three meals a day (as diabetes educators recommend) and record their time, MyNetDiary shows additional meals as several snacks, keeping track their time and carb count. MyNetDiary food database keeps track of over 45 nutrients, including fiber and sugar alcohols. MyNetDiary can calculate net carbs and diabetes carb count, and lets you select them as your main carb type. Carb counts are displayed on the Home screen, Meals, and for individual foods. For Type 1 diabetes and other insulin users, you can turn on insulin tracking in MyNetDiary, adding it to the Home screen. MyNetDiary has many types of insulin pre-loaded for you - you just need to select them from the list. You can also define your own insulin types. Similar to blood glucose, you can assign one or more labels to each insulin dose. As always, you can create your own labels. For your convenience, MyNetDiary can help you keep track of your medications. You enter your medication types and doses, and then keep track of your intake, saving time, amounts, and optional labels and notes. Beyond blood glucose, insulin, and medication tracking, MyNetDiary provides several other pre-loaded trackers, such as blood pressure, LDL and HDL cholesterol, Hemoglobin A1C, quality of sleep and so on. You can also create your very own, custom trackers, and track anything you want with MyNetDiary. When entering new values, you can also enter time, assign one or more labels, and store notes. Once you have your information in, MyNetDiary provides easy and powerful reports, helping you see everything together - foods and carbs, insulin, exercise, blood glucose, medications and other trackers. The information is grouped by day periods and displayed chronologically. You can also tap each item, to see and, if needed, edit the details. You can see different periods of each day on the same screen, swiping left and right to see different day periods. MyNetDiary also provides weekly reports, with the same information as daily reports, only adding an extra dimension - seeing your day periods over the course of week. For example, you can see how your mornings differ and educate yourself on what's working best for you. In addition to reports, MyNetDiary provides many charts - for weight, blood glucose, calories, nutrients, measurements, and trackers. On blood glucose charts multiple ranges are indicated with horizontal lines. MyNetDiary is highly customizable, allowing to select your diabetes type (or indicate that you don't have diabetes), turn insulin tracking on and off, select blood glucose units and preferred carbs type. MyNetDiary support regular "total carbs", net carbs, and diabetes carb count. You can configure many other settings, such as metric or US units, food time tracking, using contributed foods, weight display on the Home screen and more. In tracker settings you can configure many other options, such as target ranges for glucose, target values, units, and chart colors. You can create custom trackers for recording and charting your values. Type I, Type II, pre-diabetes, and gestational diabetes are supported. For fast food entry, MyNetDiary provides a built-in barcode scanner. When you enter your daily foods, tap the scanner button to activate it and scan the barcode. MyNetDiary barcode scanner works on iPhone 3GS, 4, and 4S. Currently, iPod Touch is not supported. In MyNetDiary, planning is easy. You enter your current weight, height, gender, age, and activity level. Next, MyNetDiary will calculate your calorie needs. After you enter your target weight and target date or weekly weight loss rate, MyNetDiary will estimate your daily calorie needs. You can also estimate and plan your weekly exercise. You can also customize and override your calorie targets, and customize macronutrient balance - great for low-carb and low-fat dieters! With MyNetDiary, you can also track exercise. Most exercises have MET value assigned, allowing calorie calculation based on duration. If you use exercise equipment, you can enter calories directly, for any exercise. The notes field helps you keep track of other information, such as peak heart rate. You can also create your custom exercises. If you purchase Maximum membership you can link MyNetDiary Exercise with Fitbit or Garmin activity tracker or Withings Pulse. If you often eat the same foods together, you can create a recipe. The next time you eat them, you only need to enter one food - the recipe itself. MyNetDiary Diabetes provides a powerful recipe editor - allowing you to adjust the recipe, to add or remove ingredients, or adjust their amounts. The Daily Analysis screen show your daily energy balance, estimating how much weight you are losing (or gaining) on each day. For each day, it compares your key nutrient totals with recommendations by American Academy of Nutrition and Dietetics, helping you eat more healthfully. It also provides you tips and recommendations on good eating habits, helping you be more successful. The Weekly Analysis screen shows you energy balance and nutrient analysis for a whole week, expanding the number of nutrients included into into analysis. On iOS8 and later, MyNetDiary provides a great Today Widget, helping you to check your day at a glance, and providing shortcuts for even faster entry. The widget displays your BG average for the day and the time of the next BG reminder. You can go straight to BG entry screen from the widget, to record your test result. The widget also shows remaining calories and meal buttons to jump into specific meal. Widget tools provide shortcuts for Food Check, barcode scanner, and water tracker - it's very important to hydrate properly! View BG average and next BG check reminder. Get tips and recommendations about today’s food. Log water glasses and weight. Log foods - selecting from favorites or with dictation! There are many more tools in MyNetDiary - overall, there are more than 50 screens in MyNetDiary Diabetes. They are there when you need them - water tracking, notes, optional PIN protection, and a full set of body measurements - not only weight! You can join MyNetDiary Community, with a forum supported by a Registered Dietitian, or check out our articles on weight loss and healthful living. The Diabetes Tracker app could be used standalone and it can also work with MyNetDiary.com. With MyNetDiary.com you can do more, and we recommend creating at least a free account. MyNetDiary.com provides data backup for the app. In case your phone is lost, damaged, or you are getting a new phone - your latest data are saved on MyNetDiary.com servers and could be restored on a new phone. With a free MyNetDiary account you can use the website for food and exercise entry when you prefer using a computer with a large display, mouse and keyboard. If you already have or will sign up for a paid MyNetDiary Maximum account, you have access to all features of the website, including full online diabetes tracking, extra charts and reports, printing, and more. Finally, using MyNetDiary Community tools, you can setup data sharing for your account, allowing read-only access to your diary by your spouse, relative, or care provider. MyNetDiary Maximum accounts could be linked with Withings scale and blood pressure monitor, as well as with Fitbit and Garmin. If you link your Maximum account and use it with the Diabetes Tracker app, the app will sync information automatically. First of all, MyNetDiary diabetes tracking is always available on the website - it's provided for free for MyNetDiary Maximum members. On the iPad, we recommend using MyNetDiary's Diabetes Tracker for iPhone app. Although not optimized specifically for the iPad, it is full featured and allows tracking of everything diabetes on the iPad. MyNetDiary Diabetes & Diet Tracker for Android has the same core set of features as iPhone app.